When my husband, Chris, developed a passion for gardening, I was surprised. I never thought of him as the gardening type. I thought of him more as the Gordon Gekko, “I don’t throw darts at a board – I bet on sure things,” type. As a Wall Streetbanker, my husband’s Armani suits screamed “tweed” not “weed.” His job was to buy and hold, not plow and hoe. Still, I worried. It seemed lately he’d been investing less in managed futures and more in bean stock. I questioned his ability to balance two juxtaposing worlds. I hesitated to leave him for two weeks to visit my parents for fear I’d return home to find him plowing the backyard on a John Deere tractor. I imagined him commuting home from work, negotiating his way through the crowds at Penn Station carrying clay pots he got for a bargain in the flower district. But when I returned home, I discovered that I had underestimated him. I tried to hide my shock when I surveyed his garden, which had turned into a bumper crop. It looked like a centerfold for Better Homes and Gardens. The tomatoes were taller than me, and the bell peppers bigger than a Florida grapefruit. “This is incredible, “ I told Chris, who looked more relaxed than I had ever seen him. “How did you get all that data?” I asked when he finished, an hour and thirty-seven minutes later. “I created a model that would allow me to highlight which crops provide the greatest production for occupied bed area in order to protect my profits and limit loss. If you look at this chart, it shows a compilation of quantifiable yield information based on the varieties grown, climate, and growing conditions,” he replied, holding out a spreadsheet so long it would furnish enough confetti for a New York ticker tape parade. From the looks of things, he had not only balanced two worlds, he had also optimized them. “Yes,” he said, voicing surprise. Make sure when you get the tractor you get the hat. You can’t drive a John Deere tractor without the John Deere hat. It’s like a law or something. Anyway, the proposed new “spreadsheet” spread will surely require nothing less than heavy machinery. good advice–he does have a birthday coming up. 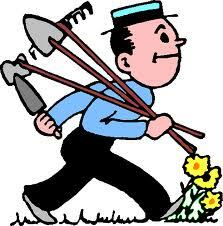 . .
What is it about men, dirt and this obsessive-compulsive behavior in the garden? My husband did the same thing to our veggie garden, except for the charts – he’s an engineer! Ha! His garden must be very symmetrical! haha, That’s awesome. I love when men surprise us. At least you are reaping the benefits! Good point! “Lettuce” be grateful! Good for Chris. He has given new meaning to the word hedge. Planting a tomato may be more rewarding than planting an idea. Lisa, I bet your husband could charge a hefty fee for his “Optimized Yard Farming” services. Organic (or not, your choice) fresh veggies at your door… he could start a franchise and train certified Optimized Yard Farmers around the globe, with different certifications by region. Katie, I think you’re on to something! That is awesome! I am jealous of both the garden and the husband that gardens. I too am “green” with envy over his garden–I can barely keep a house plant alive!